If you are a constant reader of my postings, you may be wondering what I’m doing listening to a Sherlock Holmes audio book. I know, it sounds weird and most of my readings are in the Sci-fi, Horror and Fantasy realms, but once in a while I dive into the classics, but this time I’m not straying away from my favorite genres. This collection of short stories takes the world’s most famous “Consulting Detective” into some very interesting adventures. The defining quote Sir Arthur Conan Doyle wrote for Holmes, “Once you eliminate the impossible, whatever remains, no matter how improbable, must be the truth,” is what guides this collection. This collection explores the improbable and bends the limits on improbability. There are 28 stories in this collection written by authors whose specialties range throughout the sci-fi, horror and fantasy realms. Just a few of the authors are; Neil Gaiman, Tanith Lee, Laurie R. King, Anthony Burgess, Stephen Baxter. Some of the stories in this collection are rewrites of original Holmes adventures, such as “A Study in Emerald” by Neil Gaiman. Gaiman takes the introductory story to Holmes’ adventures , “A Study in Scarlet,” and places Holmes and Watson in an alternate universe in which Lovecraftian creatures have invaded the Earth and rule the contintents. In the original story Scarlet referred to the color of the blood of the murder victim, in this story Emerald refers to the alien’s greenish blood color. I found this story to be the most fun, in that having known the original story, how the aliens created a strange turn to the clues Holmes had to decipher. In the other stories you have Holmes traveling through time, meeting with the authors, Sir Arthur Conan Doyle and H.G. Wells, explaining his 3 years of missing time when Watson believed him to be dead at the hands of Professor Moriarty. 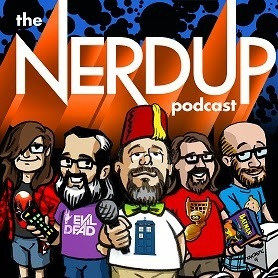 Whether you are a Sherlock Holmes fan or a fan of the strange genres of fiction you will have fun when listening to this collection. There is a bit of something for everyone here. Even some normal Holmes Adventures that just don’t seem to be solvable by Holmes. The readers, Simon Vance and Anne Flosnik swap the reading depending on whether the story is told from a woman’s point of view or a man’s. Anne Flosnik reads the stories using various accents and emotions perfectly. 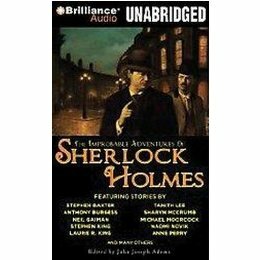 The gem in this audio book, in my opinion, is Simon Vance, throughout the book Vance captures the characters of Holmes and Watson flawlessly. No matter where the adventure takes them he is consistent with their vocal qualities and that keeps the listener tuned in to the adventure. I know there were several times I couldn’t stop listening until Holmes solved the crime. Hear from a nationally acclaimed clairvoyant and ghost hunter about her ghost-hunting experiences, tips, and techniques. 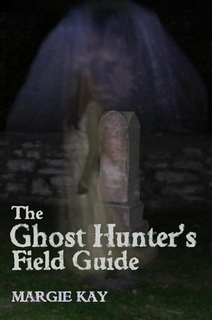 A must-have for the professional or amateur ghost hunter. The author discusses her communication with the spirit world, different entity types, dealing with negative energies, ghost hunting equipment and their uses, investigation methods, and good places to find ghosts. A listing of paranormal radio and TV shows and a glossary of terms is included, along with real photos from ghost hunts and a list of haunted places to visit. So do you like pirates, street urchins and love stories? 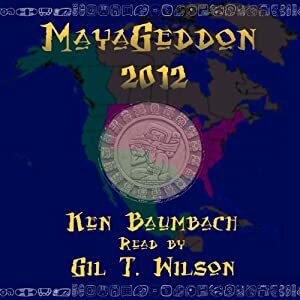 I think I may have found the perfect audiobook for you. This time around I listened to another young adult novel, and had a grand adventure from the streets of London to fighting pirates on the high seas. This adventure novel is also a nice historical novel. The story takes place during the 18th century when his majesty’s navy was battling pirates and preparing for war against France. The story is told through the voice of Mary “Bloody Jack” Faber as she lives out these adventures. It all begins with her as a young orphan on the streets of London trying to survive. Mary takes up with “Rooster” Charlie, the leader of a gang of orphans who beg on the streets to survive. Charlie takes care of his gang and Mary looks up to him as a brother. When Mary discovers Charlie dead on the dark backstreets of London, she no longer has someone to take care of her so she decides to be her on person. She takes Charlies clothes and the persona of Jack, she soon learns that as a boy things are a bit easier in the street life. Now living as Jack, she finds her way to the docks, where Navy ships are looking for ship boys, these are the boys that do the grunt work on board the ship, Jack gets on board the H.M.S. Dolphin as a ship boy and maintains her secret of being a girl. She soon boards with 3 other boys taken on at the same time and leads a life as a Navy ship boy. After a year or so on-board she finds it harder and harder to maintain the secret because her body is betraying her. Not sure what all the changes of puberty will bring, since she never had any parents to tell her, she strikes out on the next port call to a bordello to ask one of the women there what she needs to know. Upon leaving the bordello the other boys see “Jack” and add to to the myth of her being a boy, after some teasing. During this same port call the 4 ship-boys have created a pact among each other to always be true. To prove this they get tattoos and whenever a secret must be kept they swear upon their tattoos. Jack gains her nickname “Bloody Jack” after the crew of the HMS Dolphin boards a ship and she, still only about thirteen years old, shoots a plundered pistol to kill a pirate who is about to stab one of her fellow shipmates, Jaimy, who is paralyzed with fright. She comes back to the Dolphin covered in blood, and her proud shipmates nickname the little “boy” Bloody Jack. During a battle with a pirate ship in the Caribbean the HMS Dolphin is damaged and takes on water. The ship is forced to seek shelter in the cove of a small island until repairs can be made. On this island there is no wood of use to repair the ship so one of the crew members, who has been experimenting with kites, puts Jack on the kite and flies her high to scout for land. During the “flight” the kite breaks free flying Jack 30 miles or so from the Island to be marooned on another Island by herself. 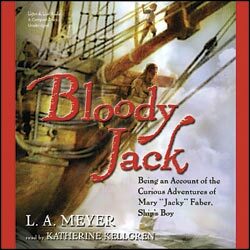 Growing up alone and trying to maintain a major secret create a great adventure in “Bloody Jack.” Basically start out with a little “Oliver Twist’ throw in some “Treasure Island” with a dash of “Robinson Crusoe” and you have this fun adventure. Katherin Kellgren does a wonderful job voicing this book. From the cockney accent of the street kids to the distinguished officers on-board the HMS Dolphin, she delivers the book with realism. Field Report: Blue Microphones Snowball. If you’re looking for a good Mic…check out this review (by me). 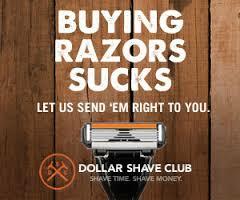 This is what I use for my podcasts.